Grammy-nominated vocalist and songwriter Sacha Boutros can sing anything from Latin jazz, jazz standards, and bossa nova, to swing, adult contemporary, and pop, and in seven languages — she does so with a sensual, yet breezy flourish. 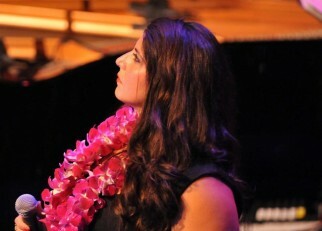 The multi-lingual San Diego native can also play serious piano and is trained in Bel Canto opera. A darling of the music industry, with a huge, international cult following spanning generations, Boutros earned a Grammy nomination for her 2008 “Simply Sacha” (Diva Latina Production) album. The critically acclaimed, hit album featured famous, in-demand session players and sidemen, Chuchito Valdés, Geoffrey Keezer and Red Holloway, a hot jazz-pop line, and major crossover potential. Her music, described as hip, Latin lounge jazz, has skyrocketed to the top of the charts and been named as one of the “Top 10 Jazz and Latin Jazz albums of 2008” in Japan and America. With three major recordings under her belt so far, including a revelatory live album released a year ago (recorded in Honolulu), Boutros continues to attract attention wherever she tours, whether it’s in San Diego, Hawaii, Tokyo, New York City, or Paris. Since first embarking on a career as a professional singer as the ingenue of Frankie Laine, Boutros has already opened for and worked with many heavy hitters, including Julio Iglesias, Marvin Hamlisch, Patti Austin, Chubby Checker, the late James Moody, Ann Hampton Callaway, Claudio Roditi, Red Holloway, Karrin Allyson, Frankie Laine, Geoffrey Keezer, Kay Starr, Herb Jeffries, and countless others. Sacha Boutros performs a tribute to the Legendary Red Holloway, who was not only her friend but her mentor and musical father. He in fact played with her on her first concert at Anthology. There will be a selection of Red Holloway’s favorite songs performed as well as some of his hits and Sacha will speak about his life and tell some of his funny stories.